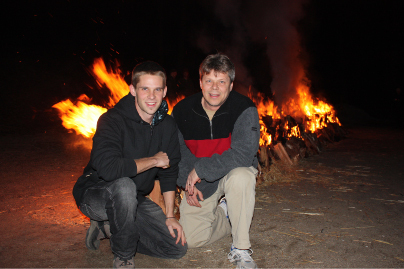 In December 2008, my son Tony and I decided to embark on a 14 day journey that was destined to change our lives forever. Now it is YOUR turn. Will you join us? The first week we met with over a 20 people from around the globe – Finland, Norway, Germany and the US. For seven days we laughed, cried, ate, slept and changed together. We walked on fire to break through our fears. 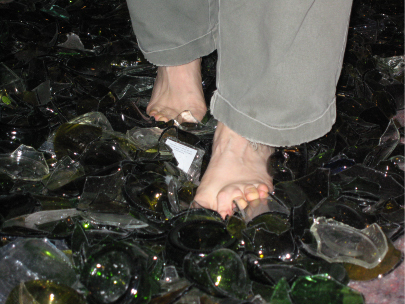 We walked on broken glass to get in touch with the intuitive knowing we all have that can keep us safe if we pay attention. We laughed, cried, ate, slept and changed together. We shared our dreams, our goals, and our hurts… habits… and hang ups. Publically. We were real. Open. Honest. From the beginning of our lives as children, students, workers – we’ve been programmed to judge ourselves based on a set of principles that really do not serve us, namely production-oriented standards. If you didn’t get straight A’s, weren’t great at sports, didn’t get voted in as homecoming queen or even never found yourself to be “king of the mountain” – you probably thought of yourself as average or maybe little above or below average. You certainly didn’t think of yourself as perfect, mighty and on top of the world. These limiting judgments about yourself were also reinforced by your teachers, parents, peer and even family and friends. And you learned to settle. You might not feel great about being mediocre, but hey… it seems to be your lot in life. Someone else might be able to produce a magnificent result. But not you. Your entire life is a testament to being and feeling less than. Chance are you have been programmed for mediocrity. Your life may be proof positive this is your reality. But ANYONE can reprogram their brain to accept, produce and enjoy extraordinary outcomes. Are YOU ready to take the leap? Really?! The first week of our journey was all about getting real and noticing while we THINK our hurts, habits and hangups were unique – they weren’t. As a people we all share common challenges. Common feelings of “less than” and fear of embarrassment, non-acceptance and downright laziness and a desire for entitlement. Then we did a variety of out-of-this-world exercises to break through our self-induced fears and create the perfect atmosphere to reprogram our brains for affiliate marketing and network marketing success. rejoice in being unemployed. Even saying the word out loud is enough to send shivers down my spine. In fact, I would much rather walk across 40 feet of 1500 degree, red-hot, 3rd degree burn worthy coals – than work for someone else. Which is exactly what we did during the first week. As well as walked across sharp, broken glass. Bend rebar and broke arrows with the soft of our throats. We also misjudged people. realized it and grew from it. We learned to care and let people know we care. We learned a cripple bird is PERFECTLY crippled – and is not in way served by us having pity on the PERFECT bird. The second week as even more intensive. The challenges were harder. The internal work was more challenging. And we were now required to STEP OUT OF OURSELVES and step into the role of serving others. So we learned how to safely and effectively share these break through metaphors with others. So if you ever walk to celebrate life by dancing on fire, walking on broken glass and defying the laws of physics by breaking an arrow with soft of your throat – give us a call. In the meanwhile, consider your programming. Is it serving you? Is it time to reprogram?